Purelements, an Evolution in Dance announces Dance Brooklyn! A World Celebration a free community celebration of dance performances and cultural diversity with performances by Darrah Carr Dance company member and TONY award winner, Trent Kowalik, Asase Yaa Cultural Arts Dance Theater, Something Positive, Ninja Ballet, Allure Latin Dance Company and Purelements, plus a spoken word performance by poet Jaime Lee Lewis to be held on June 15th, 2018 at Brooklyn's historic Kings Theatre. We believe that the basis of all human existence should be to celebrate our different views. Less conflict would exist if we shared and learned more about one another. Platforms for cultural expression like Dance Brooklyn, is an example of what we need to create deeper community connections. 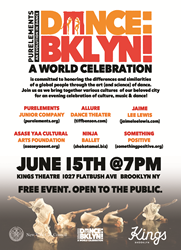 In commitment to honoring the differences and commonalities of Brooklyn’s global community through arts and sciences, Purelements, an Evolution in Dance founders, Lakai Worrell and Kevin Joseph, issue Dance Brooklyn! A World Celebration as an expression of cultural enlightenment and unification in the borough. ​​​​​​​​​​​​​​​​​​​​​​​​​​​​Dance Brooklyn!, formerly titled “East New York in Motion,” is set to return for it’s fourth annual year as a platform to create respect, understanding, and appreciation among people of various backgrounds in Brooklyn. Participating dance companies include Asase Yaa Cultural Arts Dance Theater, Something Positive, Ninja Ballet, Allure Latin Dance Company, Purelements, an Evolution in Dance, Darrah Carr Dance company member and TONY award winner, Trent Kowalik, plus a spoken word performance by poet Jaime Lee Lewis. The 2-hour event will feature modern, West African, Afro-Caribbean, salsa, contemporary and ballet x martial arts fusion dance performances. In an effort to eradicate negative stereotypes that exist about the community, Dance Brooklyn! Has evolved as a tool to inspire and strengthen the community connection. Purelements founders Worrell and Joseph ultimately present Dance Brooklyn! as a vehicle to assist in the positive restoration and transformation of Brooklyn communities and as a means to expand the vision of local politicians to understand the powerful impact of the arts in the community showcase the richness of all the borough’s pre-existent and new communities. The Brooklyn natives believe that showcasing high quality community arts presentations like this, at a professional performance venue like the historic Kings Theatre, will spark a movement toward increased support and funding toward cultural arts programs, companies and public platforms. They hope that people will leave the Dance Brooklyn! concert with a deeper understanding of dance companies in the city, their work to preserve their cultural legacy and a greater appreciation for cultural arts. Dance Brooklyn! A World Celebration will be held on on June 15th, 2018 at the Kings Theatre, located at 1027 Flatbush Avenue Brooklyn, NY 11226. Door open at 6pm. Show starts at 7pm. The show, supported by the New York City Council, is free to the community and open to all ages. To learn more about the event and to RSVP, visit bit.ly/PurelementsDanceBK (Note: RSVP is not required for admission). For press inquiries on Dance Brooklyn! A World Celebration press assets and media credentials to cover the event, please contact Jasu Sims at jasu@presstheory.com. To connect with Purelements, visit the Purelements Facebook fan page, follow the company on Twitter at @Purelements and on Instagram @Purelements. Follow the conversation online at #PurelementsDanceBK. Purelements: an Evolution in Dance is a 501(c) (3) performing arts organization founded in 2006, by Kevin A. Joseph and Lakai Worrell. The mission of PE is to use multiple facets of the performing arts as educational tools to evolve and transform the individuals and communities it serves, and to present dynamic performances that are socially relevant and impactful. PE’s mission unfolds through an art-in-education program, a performing arts program and its professional and pre-professional dance companies.To learn more about Purelements, visit purelements.org. Asase Yaa Cultural Arts Dance Theater, also known as “Asase Yaa” (“Mother Earth”), is a dynamic cultural arts institution centered on the whole African experience in America. Founded by Yao Ababio in 2001, AYAADT was created by accomplished dancers and musicians that brought bold but authentic productions showcasing the uniqueness of African dance to the American stage. AYCAF creates and nurtures pathways for heightened self-awareness and educational enlightenment for the children, adults, seniors, and families that it serves through four (4) core programs, including the Asase Yaa African American Dance Theater, Asase Yaa School of the Arts, Asase Yaa Children’s Arts Camp and Asase Yaa T.E.A.C.H. These programs are housed at the Asase Yaa Center for the Arts, which also hosts lectures, panel discussions, film screenings, book-signings, parties, and other events. To learn more about Asase Yaa Cultural Arts Foundation, visit asaseyaaent.org. Something Positive, Inc. is a not-for-profit, arts and education organization dedicated to the art and culture of the African Diaspora and its cross-cultural influences through performance and education. Utilizing a unique blend of poetry, storytelling, theater, music and dance, Something Positive specializes in multimedia performance art presentations. To learn more about Something Positive, visit somethingpositiveinc.org. Founded in New York City in June 2014, by artistic director and choreographer Tiffany Benson, Allure has always been guided by Performance with a Purpose: delivering top-tier results in a showcases, artistic expression, and providing educational opportunities in dance to people of all ages and abilities. Dedicated to presenting and teaching authentic New York Style on 2 Salsa, Allure’s instructors are quality dance professionals with many years of dance training and teaching experience, making them experts in their fields and leaders in the Latin dance community. To learn more about Allure Latin Dance, visit allurelatindance.com.